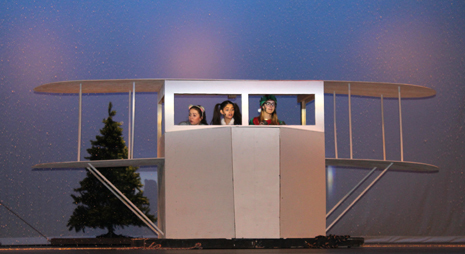 Above from left, Amos, played by Emilee Kennemur, Emily, played by Maraya Esquibel, and Calliope, played by Darian Peterson, set off in a snowstorm headed for the North Pole in Calliope’s crop duster to save Santa’s Naughty and Nice List Friday evening during Artesia High School Drama’s dress rehearsal of “‘Twas the Night Before Christmas” at the AHS Auditorium. 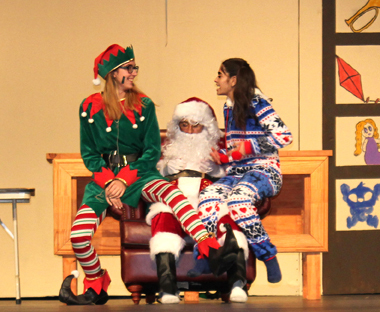 The theatre students will present the production at 7 p.m. Dec. 9 and 10 at the auditorium. The group is also conducting a toy drive for Grammy’s House. Anyone bringing a donation of new toys will receive $1 admission; regular admission is $5. At right, Peterson and Esquibel tell Santa (Nolan Winters) that it’s time to depart on his midnight ride.